Slip Through the Shadows. Steal to Survive. For a master thief like Garrett the choices are clear: profit or perish. The ultimate thief is back! Tread softly as you make your way through 15 new complex, non-linear levels full of loot to steal and guards to outsmart. 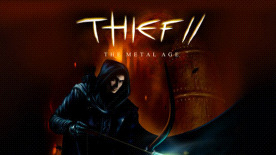 Improved enemy AI, new gadgets and a riveting story will draw you into the world of Thief II: The Metal Age, a place of powerful new technologies, fanatical religions and corruption.